What do you do when cheese expires? You go get some new cheese, of course. Players come up with an exploit. Players find a new exploit. Yesterday, Bungie patched a number of popular exploits—or, "cheeses," in player parlance—to Destiny's high-level Crota's End raid. It is now no longer possible to launch oneself through the first section on the blast from a lantern, nor is it possible to complete the bridge section without crossing the bridge. 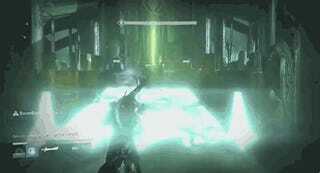 Most notable of all, you can no longer beat Crota by pulling out your LAN cable mid-fight. Those changes notwithstanding, players are already demonstrating alternate ways to solo the first two sections of the raid. For starters, the opening lantern-run can be bypassed in much the same way as before. Instead of being launched by a lantern blast, you can simply… jump to the same spot. You'll want to have your agility maxed out and a gun with the "lightweight" perk (Murmur, Ice Breaker, etc.). With that all set, go to the usual place where you'd let the lantern launch you, get the lantern to clear off weight of darkness, and do your mightiest double-jump/leap up to the higher area. The rest of the cheese plays out the same as the original method. The patch has made it so that at least one player has to actually cross the bridge during the bridge section in order to complete it. That's not as limiting as it may sound, however. It's still possible to de-spawn thralls on the first side by getting to a high vantage, and only one player has to cross, meaning that it's still possible—though more difficult—to solo the whole thing. The raid's two chests are still solo-able, though neither will offer a chance at an exotic weapon. As for soloing The Deathsinger (which now has a loot drop) and Crota himself, well, both are possible, but both will require a bit more skill to pull off. If you've found any more good exploits for Crota's End, I hope you'll share them below.